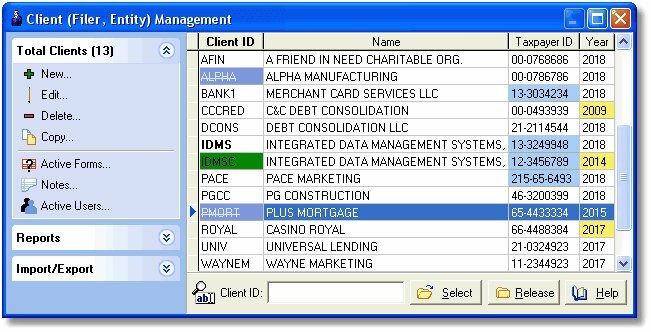 Account Ability regards all filers as clients. Depending upon the type of returns to be filed, a filer can be a Payer (1099-MISC, 1099-DIV, 1099-INT, 1099-OID, 1099-PATR, 1099-B, 1099-G, 1099-Q, 1099-R, 1099-LTC, W-2G), a Lender (1099-A, 1098, 1098-E), a Creditor (1099-C), a Filer (1099-S, 1098-T), a Trustee (5498, 5498-SA, 5498-ESA, 1099-SA), a Corporation (1099-CAP, 3922), a Provider (1099-H), a Donee (1098-C), a Transferor (3921), or, an Employer (W-2, W-2C). The Client (Filer) Management module includes all of the tools necessary for Adding, Editing, Deleting, Copying, Printing, Importing and Exporting client records. There is no limit to the number of clients you can enter into Account Ability. The incremental search panel can locate a client's record in seconds. In the illustration above, client IDMS has been located by Name with just two keystrokes - the letters ID. Client records can be located by Client ID, Name, and Taxpayer ID.